APAC Realty's FY18 results within expectations; weak 4Q18 in line with broader property market. More project launches to compensate for lower projected take up rates. Raised FY19F/20F earnings by 24%/28%. Upgrade to BUY with higher Target Price of S$0.70. We believe the property market has already adjusted to the cooling measures implemented in July last year. Going forward, transaction activities should stabilise. In the primary market, we the expect the slower take up rate for new launches to be partly offset by more project launches. Commission rates for new projects are also on a rising trend. In terms of transaction value, we expect primary sales to drop by a lesser 7% in FY19F, compared to the 22% drop in FY18, and rebound in FY20F. Both secondary and HDB resales should see 5% to 6% growth in the next one to two years. Overall, we expect the private residential market to see a slight rebound of 2% in FY19F, vs 10% decline in FY18. The HDB resale segment should continue to see 5% growth. Given that the worst may be over for APAC REALTY LIMITED (SGX:CLN), we believe the stock should be valued at its average PE of 12x, instead of -1SD of 10x previously. Our new Target Price of S$0.70 offers 23% upside to current price. The weak 4Q18 results was in tandem with the property market post the cooling measures. The total DPS of 4.5Scts for FY18 represents 66% dividend payout, higher than guidance of at least 50%. ERA has secured marketing agent appointments for 46 projects with close to 20,000 new home units to be launched in FY19. There are also unsold units of about 35,000 and a potential supply of 9,800 units from Government Land Sale sites and awarded en-bloc sites that have not been granted planning approval yet. 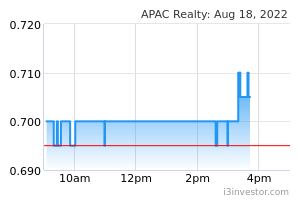 APAC Realty's group revenue in FY18 gained 5.8% y-o-y to S$424m. The new home sale segment posted an increase of 3.6% to S$128m while the resale and rental segment was up 7.1% to S$286.5m. 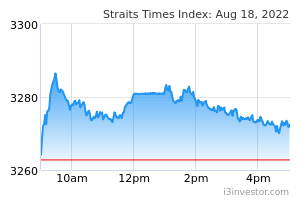 Overall net earnings of S$24.2m (-6.4% y-o-y) was in line. In 2018, the private residential market was down 10% y-o-y to S$41bn in terms of transaction value. Weak 4Q18, in line with broader market. 4Q18 was weak, revenue shed 36.9% to S$81.9m while net profit plunged 48% to S$4.1m. This was in tandem with the decline in new and resale transactions in the market post the cooling measures announced in July 2018. Private residential transactions declined 37.8% to 3,860 units in 4Q18 from 4Q17. A final DPS of 2.5cts was declared. Together with the interim DPS of 2cts, the total DPS of 4.5cts for FY18 represents a 66% dividend payout, higher than guidance of at least 50%. Stable market share in terms of transaction value and agent strength. ERA’s market share was 36.4% in 2018 in terms of transaction value, which is comparable to 37.9% in 2017. In terms of agent strength, it has a 22% market share vs 21% in the previous year. Raised earnings by 24%/28% in FY19F/FY20F. We have raised our assumptions for property transaction value growth. We project transaction value in the primary market segment in FY19F to ease 7% instead of 15% y-o-y drop previously, and to rebound by a higher 7% in FY20F instead of 5% growth. Secondary market and HDB resales is expected to grow by 5% to 6%, up from our previous assumption of flat growth. On the back of the higher transaction growth, our earnings forecast for FY19F/20F are raised by 24%/25%. Higher earnings projection supported by the healthy project pipeline. To date, ERA has secured marketing agent appointments for 46 projects with close to 20,000 new home units to be launched in FY19, as compared to about 27 new project launches totaling about 13,000 units in 2018. There are also unsold units of about 35,000 and a potential supply of 9,800 units from Government Land Sale sites and awarded en-bloc sites that have not been granted planning approval yet. More project launches to offset slower take up rate. Though the take up rates for new launches is expected to be slower, this should be partly offset by a bigger base with more project launches. Furthermore, commission rates for new projects are also on a rising trend, as developers attempt to clear old inventory and to speed up sales amid the ample supply in the market. Given the ample supply coming onstream from new launches and also stock pile from previous launches, we expect developers to offer higher commission rates, especially for the older projects. Commission rate can increase to 3% to 3.5%, vs about 1.5% to 2% in the past. Given that the worst could be over for APAC Realty, we believe that the stock should be valued at its average PE of 12x, instead of -1SD of 10x previously. Our new Target Price of S$0.70 offers 23% upside to current APAC Realty share price.